Geoiden provides surveying solutions based on the Geo Office software and GeoPad field software. For rail measurements, the company has introduced the VF Rail Survey Trolley. 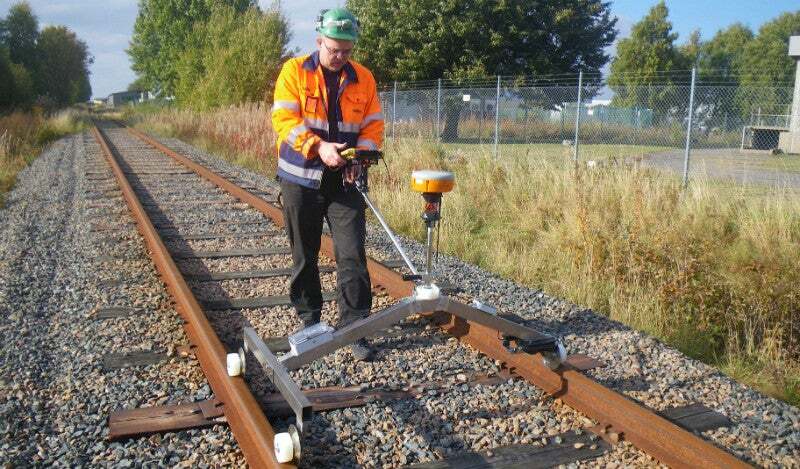 The VF Rail Survey Trolley can be quickly and easily calibrated on-site, and provides fast measurements to reduce time spent on railway tracks. It weighs approximately 20kg and allows for cable-free communications via Bluetooth, wireless local area network (WLAN) or radio depending on the logger, sensor, prism or GPS being used. The trolley supplies real-time numeric and graphical information, simultaneous logging of GPS and total station data (if available), and external maps. The system provides rail information including side offset, dH, cant, gauge, and alignment. Tamping information can be automatically generated on-site (in the form of an .ALC-file). The trolley is compatible with robotic stations and GPS from Leica, Topcon and Sokkia. It also works with Trimble, Ashtech, Altus, Septentrio, Hemisphere, Penmap and Thales GPS systems, as well as National Marine Electronics Association (NMEA) data readers for undefined sensors. One of the world’s most modern and powerful surveying packages, the company’s Geo Office software offers a simple structure with numerous advanced features for all surveying tasks. The user-friendly software provides a comprehensive report generator, as well as additional modules for alignments, volume calculation, terrain models, point clouds, tunnel surveying and network adjustment. Geo Office has been translated into several languages and used in more than 20 countries worldwide. The trolley offers GeoPad field software for any Windows® XP, mobile / pocket PC or consumer electronics device. The software is compatible with sensors from several leading instrument manufacturers, and uses the same simple structure file formats as in GEO. GeoPad has a large number of reference models for applications, including road and rail, tunnel surveying, and point-and-line stakeout solutions. The programme also has a number of features for special measurement, where VF Rail Survey Trolley is one of several. Geoiden has provided the construction industry with intelligent, cost-efficient surveying solutions since 1989. The company has supplied products for railroads, tunnels, roads, construction sites, nuclear plants, and the process industry, giving it a deep understanding for what the construction industry needs to solve all surveying tasks in the most efficient way possible. Geoiden provides some of the fastest, simplest and least time-consuming solutions available for the surveying process. VF Rail survey trolley is an efficient method of track surveying with high accuracy. Measurements can be performed in 'stop and go' or kinematic mode.